Q. What sort of computer do I need to use Broadband? Has an Operating System (OS) that supports "TCP/IP"
The companies actually state they require much more modern computers but the above will actually work, though for systems older than Mac OS X or Windows XP, the companies may be unable to provide meaningful support. If you're using an earlier system, you'll need to install software. But it would probably be easier to just get a new computer. These days people have to pay to get rid of their old computers most of which will have a much newer OS. 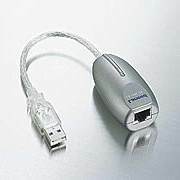 LAN ports on modern computers are very similar in appearance to modem or telephone ports, except in size--LAN ports are slightly larger. Here is an image of a dial-up modem port (left) and a broadband LAN port (right). Modem ports are usually marked with either an icon that looks like a telephone or the icon on the left above that mimics the port itself and looks vaguely like a house. LAN ports on PC's are usually be marked "LAN" or by one of a number of icons such as the one above on the right. 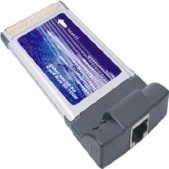 There are also adapters that connect LAN to Firewire (IEEE 1394) ports. 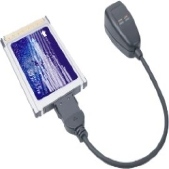 Firewire adapters also come in various shapes, similar to the USB adapters. If you don't have a LAN port, click on the "Something Missing" link below for info about LAN devices with English instructions. If you want wireless connection in your home, you may rent a wireless base router (called 'Wireless LAN Pack' on the application) from Yahoo! BB (¥1,039/month) or you can buy one at a computer store. Wireless routers will work with either Mac or Windows. In addition to a wireless router, you'll also need a wireless LAN device for your computer, if it's not built-in. Below are some typical wireless LAN devices for PC computers. Some of these can be used with Macs but all current Mac laptops have wireless built-in. For older Macs, useing an Apple "Airport" (called AirMac in Japan) card is the easiest way to go because it is not necessary to install a driver. Click on the "Missing Something" link for info on buying Wireless equipment with English instructions. If you brought your computer from your home country the power systems might be different but, in most cases, it should not be a problem. Most modern computers convert the electrical imput automatically. To be sure, look at the power input specifications on the computer's power block. Most computers work in the range 100-240V 5060Hz. As long as the range on yours includes 100V and 50-60Hz, then it will be fine. You might need a plug adapter, however. The plugs in Japan are similar to North America–they have two flat blades. However, they do not have the 3rd round ground prong. Therefore, you may need an adapter. Here are the two most commonly used in Japan. The type in the upper left includes a ground wire that you can attach to a ground point–if you can find one in your apartment. The most likely spots are in the kitchen (for the microwave oven) and the laundry room. 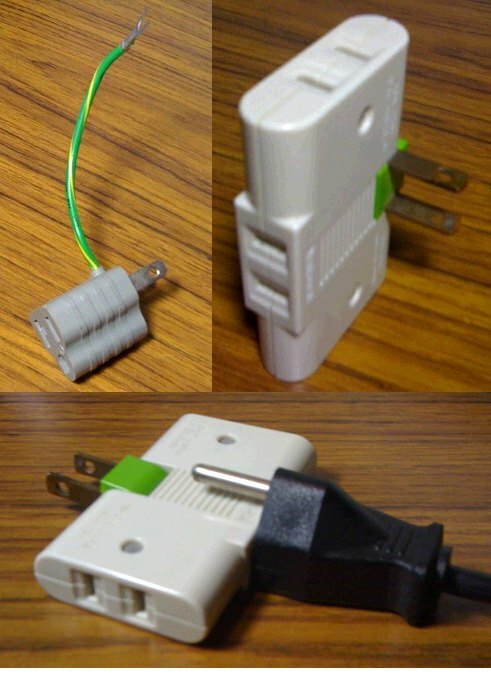 The other two photos show a common 3-way adapter that can be used to bypass the ground alltogether. We won't recommend you do that, of course. We'll merely point out that millions of millions of ungrounded computers are being used in Japan (pretty much all of them).